before 9 a.m. on January 18, 2000. For residents of North Jersey, winter made its presence felt in the form of gusting winds that brought with them a face-chapping, hand-numbing cold that made even the hardiest souls pause before walking outdoors. Although the winds will fade, the cold is here for the remainder of the week. Forecasts call for temperatures to rise above freezing just once this week -- Thursday, when snow is expected. The cold weather didn't break any records, but it did bring misery to many. 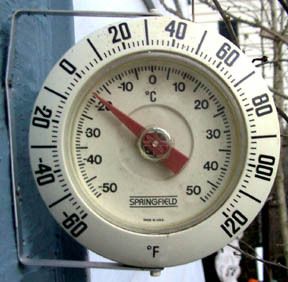 Folks in Westwood woke up Monday to the 4-degree temperature. 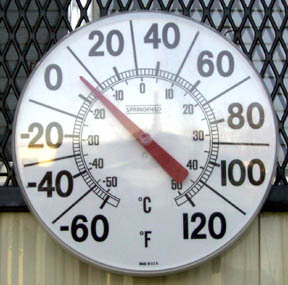 The mercury read 6 degrees in Hawthorne. The low in Newark was 8 degrees. Wind speeds of 20 to 30 mph resulted in wind chill advisories of 15 to 25 below zero throughout most of the state for the day, according to the National Weather Service. "This is right on schedule," said Bob Ziff, a spokesman for the North Jersey Weather Observers -- a group that records temperatures throughout Bergen and Passaic counties. "People may not like it, but we usually get cold air and storms this time of year." The winds brought down tree limbs and power lines, the cold burst pipes and knocked out car batteries, and the frigid air made it dangerous to stay outdoors for long periods. Luckily, many residents throughout New Jersey were able to stay home from work Monday, in observance of Martin Luther King Jr.'s birthday. Matt Biagini of Vernon, Robert Berkhofer of Saddle Brook, and Tim Merriman of Airmont, N.Y., were part of a United Water work crew clearing debris from the frozen Oradell reservoir Monday. Using pitchforks and rakes, the intrepid men dragged debris from the frozen waters as the wind slashed at their faces. "If it gets too brutal, we take a cold break," said Biagini, who was wearing four layers of clothing under his coat. "We sit in the truck, warm up a little, and drink coffee." Plumbers working outdoors at the site of Bergen County's new administration building in Hackensack built shelters from tool boxes and used portable heaters to provide a defense against the cold, but it did little to stop the winds. "The wind is really bad today," said Tom Austin, who was clad in three sweaters, a flannel shirt, and a coat. "It's dangerous too. It blows ladders over." Flying debris was only part of the problem Monday. The biting cold posed dangers of its own. Although hospitals in the area did not report any cases of frostbite Monday, doctors warned of the dangers from prolonged exposure to the severe weather. "If you have to go out, layer up and stay dry," said Dr. Joseph Feldman, vice chairman of the emergency trauma department at Hackensack University Medical Center. "Don't drink alcohol, it makes you colder. Drink warm fluids. It's an old wives' tale to drink something cold." Frostnip, the precursor to frostbite, can develop in as few as two hours, Feldman said. The warning signs include blanched and painful skin on fingers, toes, and earlobes. The condition is reversible by quickly warming the affected areas. "It's better to rapidly re-warm than to slowly re-warm," Feldman said, adding that immersion in warm water is an effective method of treatment. Signs of frostbite, a more serious condition that could result in limb loss, include skin that has turned from blanched to wooden and hard, and extremities that have lost feeling. In Passaic County, frigid temperatures proved too much for some water pipes and displaced five families in Wayne after a sprinkler line burst, flooding their homes at the Four Seasons condominium complex. At North Haledon's High Mountain School, the drinking fountains were off-limits Monday, one day after a nearby pipe burst open. Principal Donna Cardiello said she was uncertain if the water will be safe for drinking today, but said there is plenty of bottled water on hand for thirsty students. And AAA North Jersey, which serves Bergen, Passaic, and Hudson counties, said it received nearly double the usual number of calls for a Monday -- nearly 1,800 -- mostly reports of dead car batteries. "We have been very busy," said David L. Hughes, executive vice president of AAA North Jersey. "Mondays are normally our busiest day in winter because cars sit all weekend." Winds also took their toll on electric service throughout the state, with PSE&G reporting about 2,000 customers who lost power Sunday night. "There will probably be the same kind of scattered problems throughout the day," PSE&G spokeswoman Kathy Ellis said Monday. "Never assume we know [about a power outage in your area]. Don't be reticent to call if your power goes out." The cold is also spawning an increase in insurance claims. At State Farm Insurance Companies, the nation's largest insurer, spokesman Chris Neal said they received 50 claims for wind-related damage and 30 for water-related damage just from Friday to Monday in New Jersey. "The trigger is really 20 degrees. When we see sustained temperatures below 20 degrees, the pipes start freezing," Neal said. "If we see another two or three days of this, we'd expect literally hundreds of frozen pipe claims throughout the state." Staff Writer Dan Kraut contributed to this article.